We have the false idea that we may do anything in order to save ourselves . . . when the inverse is actually true . . . we can do nothing to save ourselves . . . and we best become selves by emptying out the self to make room for God . . . the all. We believe erroneously that our secret thoughts have no effect on the world . . . but they do, because our thoughts form our actions. We must allow ourselves to be searched by God, as the psalmist sings in Psalm 139: Oh God, you search me and you know me, you know my resting and my rising, you discern my purpose from afar. Paul wrote to the contentious group in Corinth, telling them that the Spirit moves best when there is a diversity of voices and obedience to the Law of Love. We too might remember this as we go about our work and our play with those who would follow those other than Christ. And so we pray: Help us to listen to one another, to help one another, to witness to your Oneness in us. Help us to see one another, to empathize with one another, to act as Christ in all circumstances. Help us to be guided by one another, to find union with one another, to see that only when we bridge differences will we truly be the One you seek. Amen. A re-post from December 8, 2011. Today we celebrate the coming of the One who teaches us how to pay the Temple tax, how to live in this world while not being part of it. When we throw ourselves into understanding and living the Gospel we run the risk of becoming fanatic about its meaning and implications. Ultimately, God speaks to each of us in our hearts to answer questions and to clear up ambiguities. In due course, God makes the meaning of his Word known . . . and it is for each of us to learn how to best live out this Word. The story of Jesus paying the temple tax with a coin found in a fish is one that appears simple but is, in fact, complex. It calls us to examine our relationship with the society’s civil and religious structures. It asks us to evaluate our own concept of personal freedom. As a youngster I was fascinated by the idea that my personal liberty ends where others’ liberty begins. I remember the animated discussions my middle school teachers sparked with their blanket statements; these generalities were blatant syllogisms of reason used poorly and we young people responded enthusiastically. We honed our systems of well-ordered logic and practiced the art of zeroing in a specious argument with respect and courtesy. As a young woman the realities of life asked me to draw lines and determine boundaries; and I began to learn how to effectively and politely use the phrase that is not my problem while still taking responsibility for my actions. It was a time of separation from the old with an exciting entrance into to new. I tried to fully comprehend my Dad’s warning that it’s not so bad to be ignorant of the facts but it is unforgivable to be stupid! Dad encouraged us to learn as much as possible in order to keep our risk of being ignorant low; and he was clear that there was no excuse for a lack of common sense. Stupidity, in his view, was a willful neglecting of the facts that blocked our own liberty or the liberty of others. Dad worked hard at being open and he encouraged that openness in us. In today’s Noontime Jesus teaches by his example. As happens so many times in the Gospel accounts Jesus lays open reality for us to examine. He gives us an opportunity to educate ourselves. He encourages us to hone our sense of fair play. He asks us to think about others while at the same time we refine our sense of fair play and propriety. Jesus asks us to think for ourselves, to use divine logic and in brief . . . Jesus asks us to grow up. It is clear from his actions and words that Jesus places prime importance on taking care of others even to the point of sacrifice. But it is also clear that we are responsible for observing spiritual and actual parameters. We are not encouraged to enable or pretend but rather, we are asked to serve others before self, act in kindness, hold true to the commandment of love we have been given, and to exercise our own freedom while not trampling of the right of others to likewise be free. Many of us have difficulty with this lesson and yet once learned it is not forgotten because the sweet joy of personal liberty has a value beyond price. The boundary between self and others is clearly delineated by courtesy and kindness. The rule of generosity and compassion pertains to each and to all of us. The temple tax is to be paid out of respect for others . . . but the legitimacy of our own relationship with God is never to be forfeited. A re-post from November 21, 2011. Barton, John, and John Muddiman. THE OXFORD BIBLE COMMENTARY. Oxford, UK: Oxford University Press, 2001.866. Print. 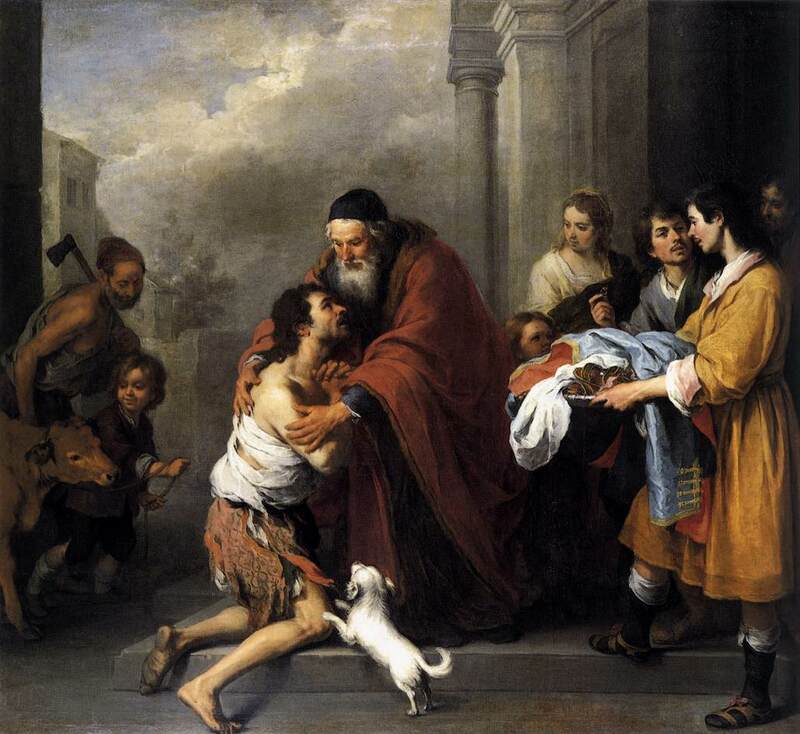 Bartolome Esteban Murillo: Return of the Prodigal Son – National Gallery of Art, Washington, D.C., U.S.A. Yesterday we shared concepts from Hispanic life and culture as we explored the paradox of Jesus’ death and rising. Examining the dichotomy of humanity and divinity shared in one person, we invite visitors to share their own experience of duality in the comment bar. Today, part two of our post brings us more resources to search for clues to our own duality. Golden Age mystics bring us liminal prose and poetry: Dark Night of the Soul by St. John of the Cross, and the trances of Teresa of Avila. One of Europe’s earliest and oldest universities with Fray Luis de Leon in Salamanca, moves education forward while horrific wars with the French, the Turks, the British, and the Americas give birth to an endless list of bifurcations. Existentialism moves forward through the works of Miguel de Unamuno and his Atheist’s Prayer. If we ever want to meditate on choosing between two roads or living in multiple realities, we only need to dip into Hispanic culture. In today’s citation we have just finished hearing Jesus speak about beatitude, and the fulfillment of the Mosaic Law with the new Law of Love. We have just heard him say that he abides with the broken in spirit, heart and body rather than the wealthy, famous and powerful. We have heard him urge us to knock, ask and seek rather than to comply, give up, or remain silent. Now, he points out to us the dualities that always lie before us. There are always at least two roads; false and true prophets either lure or teach us; real and unreal disciples urge to follow someone or something; evil and good shepherds kill or give life; and we might choose two types of homes to build in a kingdom we are invited to form. We have choices to make, roads to travel, spirits to test and deeds to perform in Christ’s name. When Christ calls, we will recognize his voice. Let us answer with courage and love. When we call, Christ will recognize our voices. Let us persist in hope and fidelity as we share Christ’s Easter joy. 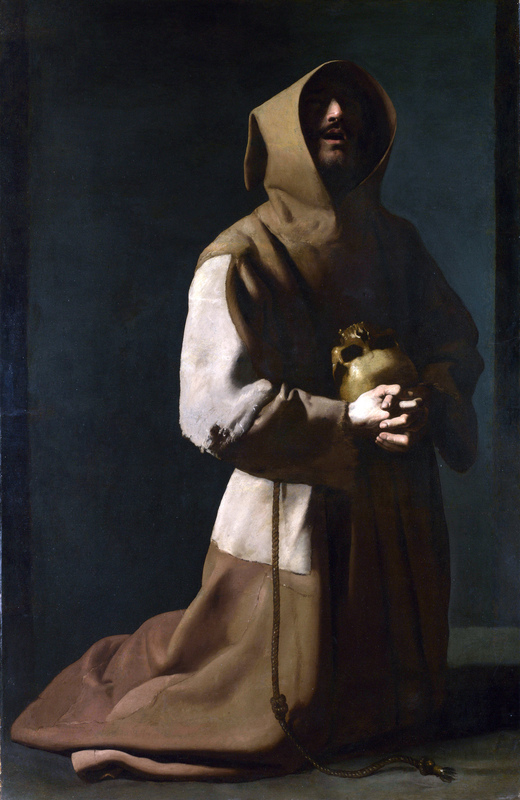 Francisco de Zurbaran: Saint Francis in Meditation – The National Gallery, London, U.K.
We must practice listening in the here and now for the shepherd’s voice. We must practice calling out Christ’s name to ask for help. We must rehearse how we will both receive and grapple with answers. We must practice dialog with God. We must ask the Spirit’s help to suffer well so that others and we may live forever. For there is no other redemption, no other saving grace, no other blessing than following the Voice of the Shepherd. There is no other Way but to make a single harmony of the dual song of God’s Call and The Faithful’s Response. Let us practice this duet with our God each day. Today we are on the eve of the Fourth Sunday of Easter when we will revisit the parable of the Good Shepherd. Let us prepare to knock on the doors the world closes to us. Let us ask the difficult questions the world throws at us. And let us forever seek the merciful justice Christ shows us in the duality of his being. We invite you to share dualities you find in your own lives in the comment bar. Adapted from a reflection written on January 12, 2009. Visit John 10:1-18 for the parable of the Good Shepherd. Follow links here to learn more about how others lived their experience of duality. To dive into the world of Spanish artists in the Golden Age of abundance and scarcity, spend time with the art of three outstanding painters: Diego Velázquez, Francisco de Zurbarán and Bartolomé Esteban Murillo. We must be willing to give up our comforts if we hope to find true wholeness. We must be willing to be authentic if we hope to overcome evil. We must be willing to pace ourselves if we want to serve God through a lifetime. We must be willing to live the Law of Love if we want to follow The Way. We must be willing to forgive those who harm us if we expect to agree with God’s judgment rather than impose our own. God says: My servant Paul wrote these words to the Romans two thousand years ago. Today he writes these words to you. When you seek to live a new life, you discover the gift of wholeness that I gladly give to you. Using the scripture link and drop-down menus, we open the door to a new life. We have sought wisdom; we have sought justice. Today we seek Christ’s way of love, and we begin with the Book of Exodus. Do not mistreat or oppress a foreigner; remember that you were foreigners in Egypt. Do not mistreat any widow or orphan. If you do, I, the Lord, will answer them when they cry out to me for help . . . If you lend money to any of my people who are poor, do not act like a moneylender and require him to pay interest. If you take someone’s cloak as a pledge that he will pay you, you must give it back to him before the sun sets. The Hebrew people were called to remember that they had once been aliens in a foreign land. Today we have the opportunity to answer to this call by caring for the most vulnerable among us. The Hebrew people were called to put aside self-interest and to respond to the divine call to be generous as God is generous. Each morning when we rise, we have the opportunity to pledge to both seek and enact love that day. Each noontime when we pause, we have the opportunity to reflect on the depth of that pledge. And each evening when we consider our work and prayer, we have the opportunity to rededicate ourselves to seeking love with ample hearts, with focused minds and with full strength.